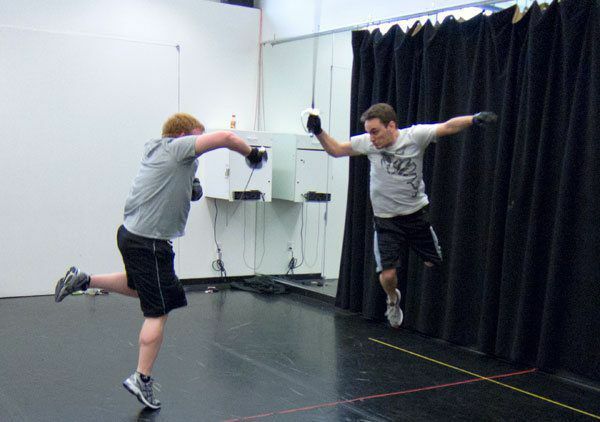 AMDA LA Stage Combat Department works to train AMDA students and alumni in a variety of fight techniques as part of a top notch program that is recognized by the internationally renowned Society of American Fight Directors. 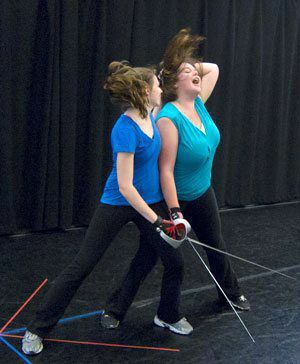 In addition to our current AMDA students, any AMDA alumnus who has taken up to Stage Combat 3 is welcome to submit him or herself for the opportunity to come back and prepare for the Skills Proficiency Test with AMDA faculty Lacy Altwine. On Sunday May 26th AMDA Hollywood will host its 14th SKILLS PROFICIENCY TEST (S.P.T.). Certified Teacher (CT), Lacy Altwine will guide 63 AMDA students through this day with the help of her assistants: Maggie MacDonald and Travis Sims. The students will perform 53 different weapons test in front of guest Fight Master, Geof Alm. AMDA has a long and successful history when it comes to the SPT. Former Combat Supervisor Robert Hamilton believed strongly in the value of offering these tests to the AMDA students. With the support and guidance of David and Jan Martin, Robert built an incredible combat program at AMDA — rivaled by no other college or university in the United States! The SPTs are the icing on the cake, so to speak! They are a recognized form of “credentialing” showing achievement and proficiency in this highly skilled craft of theatrical combat. Students get to demonstrate their skills in front of a Fight Master from the internationally recognized organization SOCIETY OF AMERICAN FIGHT DIRECTORS (SAFD). AMDA HOLLYWOOD has held 13 different SPT TEST DAYS since opening the campus in 2003. 386 AMDA students have tested. 692 individual weapons tests given. The Society of American Fight Directors (SAFD) is a nonprofit organization devoted to training, and improving the quality of stage combat. Committed to the highest standards of safety in the theatrical, film, and television industries, the SAFD offers educational opportunities across the country at universities, privately, and at the annual National Stage Combat Workshop expressly to disseminate this information. Following AMDA’s test day in 2010, Fight Master Brian Byrnes was quick to comment, “Your students are some of the most skilled and grounded fighters I’ve seen.” He added, “The Combat program here at AMDA is consistently delivering great training and skill to these actors”. These compliments from Mr. Byrnes are an excellent nod to the program and school considering that he not only adjudicates SPTs at some of the most prestigious acting schools and universities across the country, but he is also an Associate Professor at the University of Houston School of Theatre & Dance, Director and Choreographer at the Alley Theatre and the Houston Opera. Thanks again to the Education and Administration Departments for their efforts to make these classes work in the schedules and also, to our Artistic Directors, for their continued support and commitment to the SPT and Advanced Stage Combat training. The Combat Faculty and students who participate on a yearly basis give thanks for this enduring opportunity! For further information please contact Greg Dolph or Lacy Altwine. About Lacy Altwine: Lacy Altwine is a Certified Teacher with the Society of American Fight Directors. She’s been an actor since childhood, but became hooked on stage combat and stunt work in 1994 and has since performed in and choreographed violence for many productions in film and TV as well as professional, community & fringe theaters in the Midwest, Pacific Northwest and Southern California. Lacy currently teaches stage combat at the AmericanMusic & DramaticAcademy in Los Angeles and also teaches at workshops all across the U.S. Lacy is also a member of Revenge Arts and the Los Angeles Fight Academy. Over the years, she has taught 6 Skills Proficiency Tests at AMDA in multiple weapon styles for each test, which have included: Unarmed, Rapier & Dagger, Broadsword, Knife, Smallsword, and Singlesword. Unarmed and Rapier & Dagger are the foundation weapon styles, and the other four styles are offered to the upper class BFA students and the Alumni students. She is currently teaching Singlesword to the Alumni class and everyone is having a blast! About Geoffrey Alm: Fight Master Geoffrey Alm studied in England with John Waller at the Drama Studio in 1977. In the summer of that year he passed the British Society of Fight Directors Certification test, adjudicated by William Hobbs. He has been teaching the Society of American Fight Directors Skills Proficiency Tests in Seattle since 1988. He now teaches Stage Fighting at the Professional Actor's Training Program, at the University of Washington, and also at Freehold Theatre Lab, in Seattle. He has taught workshops all over the Northwest and around the country. And he has directed fights for over 100 Equity productions since 1986, locally and nationally.